The Oli government is taking long-overdue steps to broaden Nepal’s foreign policy horizons. Nepal for a long time has heavily invested its time and energy to deal with India and China, the regional giants and Nepal’s only two bordering countries. But now Kathmandu has started to reach out to its old allies, which are being newly considered as key development partners. Mainly after the restoration of multiparty democracy in 1990, the success of any Nepali government was measured on the basis of its ability to keep cordial relations with India and China. Successive governments paid little or no attention to engaging with old partners like the United Kingdom, the United States, Japan, and other European countries. Kathmandu has likewise not paid sufficient attention to Gulf countries, which host millions of Nepali migrant workers. These workers face a lot of problems related to their wages and safety. In its election manifesto, the Left Alliance – now the ruling party — pledged to take measures to revisit foreign policy. Sure enough, the new government formed under Communist Party of Nepal Chairman K.P. Sharma Oli has started to reach out to other countries beyond India and China, earning a positive reaction in Nepal’s political and diplomatic circles. At the same time, there are criticisms that the Oli government is focusing only on bilateral visits instead of formulating clear policies. All Nepali prime ministers since 1990 have focused their attention on drawing the support of India and China to ascend to power, which also invited foreign interference in the internal political affairs of Nepal. In the 30-year long Panchayat era, Nepal’s monarchy reached out to other countries beyond India and China. After 1990, Nepali politicians paid few bilateral and official visits to other powerful countries, nor there were high-level visits from those countries. On the other hand, there have been frequent high-level visits between Nepal and India and Nepal and China. There has been continuous engagement at various levels with both Nepal’s neighbors as well. There is a tradition that every prime minister after taking office makes his first foreign trip to India, which will be followed by a China visit. After these visits to India and China, there is a sense that the government’s foreign policy has been accomplished and the prime minister will focus on internal issues. The new government, which is expected to stay for the next five years, has started to correct that past approach. Oli has already visited India and China, but he seems to have realized that Nepal should reach out to other countries as well. Some other countries had expressed their displeasure at Nepal’s typical policy of dealing only with India and China, another factor that prompted the new government to expand the horizons of Nepali foreign policy. Oli held some positive bilateral talks on the sidelines of the United Nations General Assembly (UNGA) meeting this fall. Unlike previous visits of Nepal’s prime minister to New York, Oli took this opportunity to meet with many leaders. He held bilateral talks with Cambodian Prime Minister Hun Sen, Swiss President Alian Berset, British Prime Minister Theresa May, and Canadian Prime Justin Trudeau. This was the first time in recent history that Nepal’s prime minister held bilateral talks with such a wide variety of countries. Nepal has also been active in reaching out at the ministerial level. Recently, Foreign Minister Pradeep Gywali visited Japan and signed some memorandums of understanding (MoUs). 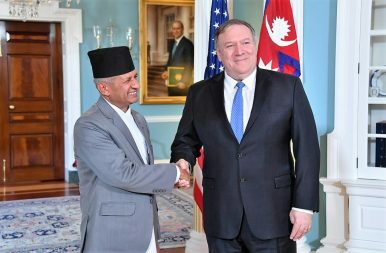 On December 18, Gyawali held a meeting with U.S. Secretary of State Michael R. Pompeo in Washington, D.C. According to local media reports, this was first official meeting at the foreign minister level since 2001. As Nepal enters an era of economic development, it needs more foreign investment. India and China cannot fulfill Nepal’s economic needs; the government should expand the horizon of economic diplomacy. Current steps are promising, but the government still lacks a clear vision and plan to attract funds. Kamal Dev Bhattarai is Kathmandu-based writer and journalist. Why Is Nepal Sticking up for Venezuela’s Maduro? In a faraway political crisis, Nepal has chosen China’s preferred side over the United States’.